Allergic asthma requires an IGE response. The IGE response is determined by T- and B lymphocytes. Central to the processes is the interaction of antigen with mast cell-bound IgE molecules. Anatomically, airway epithelium and submucosa include dendritic cells which process antigen. Dendritic cells, following uptake of antigen, move to local lymph nodes, there presenting material to T-cell receptors. In some circumstances (perhaps genetically determined) antigen interaction with naive T cells (TH0) in the presence of IL-4 results in TH0 cell differentiation to a TH2 cells. Concurrently, this process, while facilitating asthma inflammation, also promotes B lymphocyte transformation from IgG and IgM production to IgE production. Following sensitization due to prolonged antigen exposure, very small amounts of antigen can produce significant worsening of the chronic underlying disease (asthma). The central role of immune processes is reflected in the causal relationship in asthma in about 33% of all cases with contributory involvement in probably another 33% of cases. 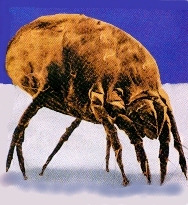 Although allergic asthma is typically seasonal, nonseasonal asthma can result from continued exposure to animal danders, dust mites, molds, etc. Antigen exposure can induce an immediate airway obstruction response within the minutes timeframe with fairly rapid resolution. However, in 30%-50% of cases, a late reaction which is another bronchoconstrictive event, may occur from 5-10 hours later. Sometimes only this late reaction is observed. The initial response to inhale allergen probably depends on antigen-Ab interactions on pulmonary mast cells with subsequent rapid release of mediators. 1 Acute asthma attacks may be induced by certain drugs, the most common of which include beta-adrenergic antagonists, sulfite-containing agents, aspirin, and coloring agents such as tartrazine. Significant morbidity is associated with drug-induced bronchial constriction with death having been attributed to aspirin (or other nonsteroidal anti-inflammatory drugs) or beta adrenergic blocker ingestion. Aspirin-induced asthma appears to occur more frequently in adults relative to children. In aspirin sensitivity may begin with a vasomotor rhinitis (perennial) which leads to nasal polyps (hyperplastic rhinosinusitis). 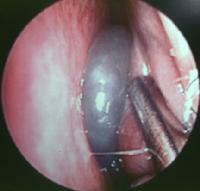 Rigid endoscopic view of the left nasal cavity, showing the spetum on the left. 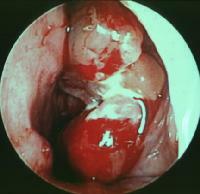 Polyps with some blood and hemorrhage are on top of them in the center portion. The rim of white from 1 o'clock to 4 o'clock indicaes the laternal nasal wall vestibute. The polyps cover the inferior turbinate, which is partially visible at 4 and 5'oclock." Rigid endoscopic view of the left anterior nasal cavity, showing the septum on the left, a suction pushing the inferior turbinate on the right and the clear antral-choanal pymp at the center of the endoscoptic view." Asthma exacerbation may be induced by elevated concentrations of atmospheric pollutants/antigen's which may occur in particularly industrial or densely populated cities. Such accumulation is favored under certain weather conditions which create relatively stagnant air (thermal inversions). Asthmatic patients will be most severely affected, although the general population will also perceive respiratory effects. Ozone, nitrogen dioxide and sulfur dioxide have been identified as particularly important air pollutants in this regard, although sulfur dioxide requires both a high ventilatory rate and concentration. Airborne antigens (pollen) can seasonally rise to sufficient concentrations to markedly increased hospital admissions as well as death rates. Seasonal effects may be diminished impact by early use of anti-inflammatory agents. Prolonged exposure in the workplace to a variety of substances may exacerbate asthma or induce an asthma attack. 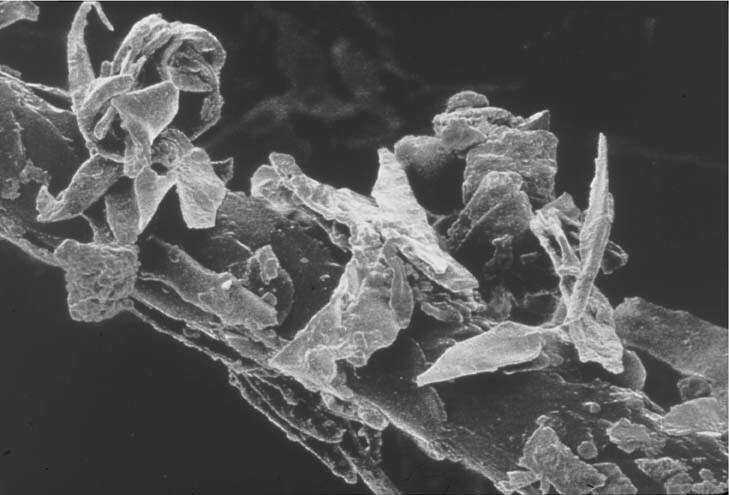 Bronchoconstriction may occur as a result of exposure to metal salts such as platinum, nickel or chrome. Other concerns involves wood or vegetable dust, certain drugs such as antibiotics, cimetidine, as well as industrial chemicals and plastics. Enzymes found in detergents and animal/insect dusts, serums, or secretions may also be provocative substances. These chemicals may also be found outside the workplace environment. (3) the agent directly causes bronchoconstrictor substance liberation. 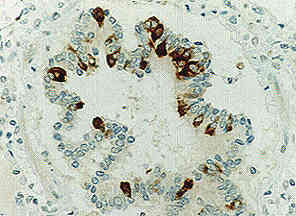 "Human infant lung, post-mortem tissue: immunohistochemical staining for Respiratory Syncytial Virus (RSV) using NCL-RSV3. Acute worsening of asthma would be most likely due to respiratory infection. The major factor is not bacterial or allergic responses to microorganisms would rather is a respiratory virus. In children the two most important viruses would be respiratory syncytial virus and parainfluenza virus. 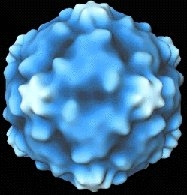 In the older child in adults, rhinovirus and influenza virus would be more common. An active respiratory tract infection is necessary to induce the asthma attack, going beyond colonization. In the individual whose asthma had been under control, such a respiratory infection can destabilize the condition for extended periods, e.g. weeks. A possible basis for this effect would be a viral-induced production of T-cell-derived cytokines which promote inflammatory cell infiltration into the airway. Acute asthma attacks are often provoked by exercise. Exercise, differing from other provocative factors, is not produce long-term effects and does not increase intrinsic airway reactivity. Bronchospasm can be induced by exercise in essentially every asthmatic patient and in some cases it is the only provocative act (at least initially) or exposure that causes asthmatic symptoms. The severity of exercise-induced bronchoconstriction include ventilatory levels as well as humidity and temperature of the inspired air. The direction of the effect is that higher ventilation rates with reduced air temperature tend to promote greater obstructive responses. Running as opposed to walking causes a more severe asthmatic attack, even if the air temperature and humidity are the same in both cases. Furthermore for any given exertional task, cold air will tend to enhance the obstructive response and warm, humid air would likely reverse the effect. With respect to specific sports then, ice hockey & cross-country skiing our activities that would be more likely to cause an asthma attack then swimming inside, in a heated pool. A possibility, in terms of mechanism that might explain exercise-induced obstruction, involves thermal induction of hyperemia with microvascular engorgement of the bronchial wall. Psychological factors appear to interact with underlying asthma pathophysiology either to worsen or improve the disease state. The psychological effects appear important to about 50 percent of patients. Physiologically, airway caliber may be modulated through vagal efferent activity although endorphins may also contribute. Patients may be "suggestible" with suggestion resulting in changes in adrenergic and cholinergic stimuli effects on airway. Psychophysiological effects appear variable from patient to patient and possibly variable within a patient depending on the nature of the episode.